Some of the Caribbean's busiest walking trails. The U.S. Virgin Islands National Park Visitor Center located near the Cruz Bay ferry dock is open daily from 8 a.m. to 4:30 p.m. Hiking is the name of the game on St. John. Most people hike the trails on their own. Guided walks are conducted several times weekly by park service guides, who are very familiar with the island's history and resident wildlife, including the wild donkeys, mangrove cuckoos, gallinules and pelicans. A walking schedule is posted at the interpretive center, an excellent place to stock up on books describing the native vegetation if you decide to take self-guided hikes, which is what most people do. Although there is no fee to enter the park, use areas such as Trunk Bay and guided hikes do carry a charge. 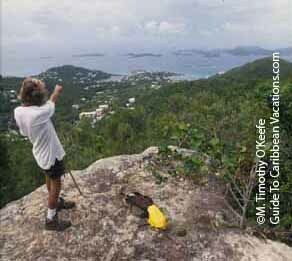 The guided walks include the Reef Bay, Cinnamon Bay and Leinster Bay hikes, plus a walk through the Annaberg Sugar Mill. For instance, on the guided Reef Bay walk, there is a $15 transportation fee for boat pickup at the bottom of the trail. In all cases, hikers need to provide transportation to the trailheads. For more information, check out http://www.nps.gov/viis/. Because most of St. John is only slightly above sea level, it is one of the Caribbean 's few major hiking islands where you'll be concerned about mosquitoes, mostly early and late in the day, or during rainy periods. Carry bug spray. It's also drenchingly hot much of the time because of the low altitude, so water bottles are essential. The only supplies are at Cruz Bay and Coral Bay. The paths here are well marked but if you do get lost, head downhill where you'll eventually reach water. The sun sets suddenly here, usually by 6:30 in winter and by 7:30 in summer, so don't linger on the trails near sunset or you could find yourself stumbling around in the dark. And it will be very dark because there are so few lights around.